Teammates at UConn and with Team USA and rivals in the WNBA, the two guards have become the gold standard at their position -- in wildly contrasting styles. The evolutionary track of WNBA guards will someday stem from the league’s all-time leaders in points and assists. There’s the Diana Taurasi model: flamboyant, dominant and entertaining. An insatiable quick-strike scorer with incredible range whose intense will to win is fueled and sometimes undermined by her volatile temperament. And there’s the Sue Bird model: smaller, cerebral and savvy. A consummate playmaker who looks as if she floats when she runs around giants on the court and delivers pinpoint passes with uncanny aplomb and acumen. But there’s no disputing their impact on women’s basketball since teaming up at the University of Connecticut and leading the Huskies to a 39-0 record en route to the 2002 NCAA championship. It’s why Auriemma is savoring this WNBA semifinals between Bird’s top-seeded Storm and Taurasi’s No. 5 Phoenix Mercury, in which his former players have been the chief architects of a pair of thrilling contests. True to form, Taurasi has been unstoppable while draining 4 of 9 three-pointers for 25 points in Game 1. And the 6-foot Mercury guard put on an incredible show in Game 2 on Tuesday, highlighted by her 28-point performance that included a 14-point outburst in the fourth quarter and a dramatic three-pointer with 3.6 seconds to force overtime. “I wish we’d had a chance to see them on a regular basis when they were younger, playing in the finals, playing for it all, the way we got a chance to see Magic and Larry Bird,” Auriemma told The New York Times. Including Tuesday’s game, Taurasi and Bird have faced each other 10 times in the WNBA playoffs, and their personal series is tied 5-5. Taurasi averages 20.7 points and 3.4 assists in those contests; Bird’s numbers are 14.1 points and 5.7 assists. Taurasi’s Mercury beat Bird’s Storm in the 2007, 2011 and 2017 playoffs, while the Storm won the teams’ postseason matchup in 2010. “Do you think I want to see Sue after a tough game?” Taurasi said, smiling. “But I do, though. We’ve gone beyond that. Bird added: “We’ve been through a lot together. We’ve seen each through deaths in our families and just a lot of personal growth. We’ve seen each other succeed. We’ve seen each other fail. We’ve been a part of those successes together and apart. 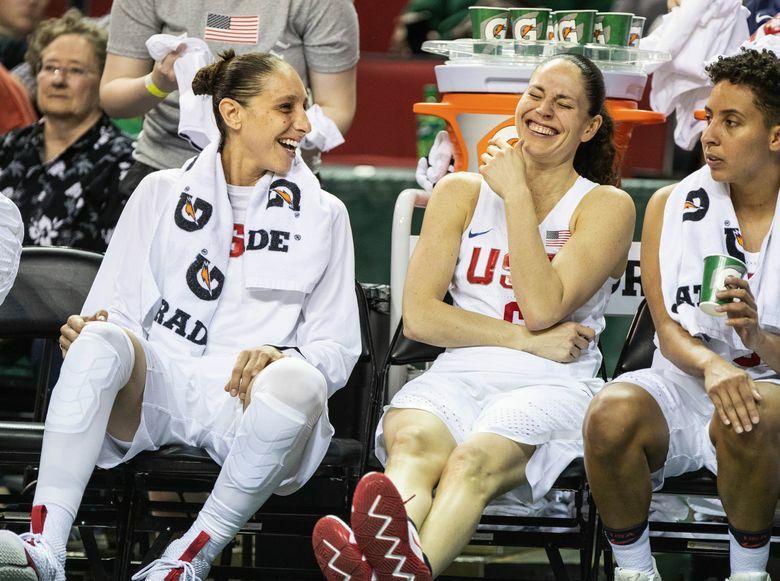 As Team USA members, they’ve won four Olympic gold medals and two FIBA World Championships. They lived together for four years in Moscow while playing for team Spartak in Russia. And they’ve paired together in eight WNBA All-Star Games. Bird drew inspiration from Taurasi before announcing last year that she’s gay – a decision she wrestled with for awhile. And some reputations are difficult to shake even if they’re deserved. For instance, Bird and Taurasi say they’ve been typecast by the public and media to fit a narrative that’s not always accurate.